SHEILA QUIGLEY has no Thorn in her side! 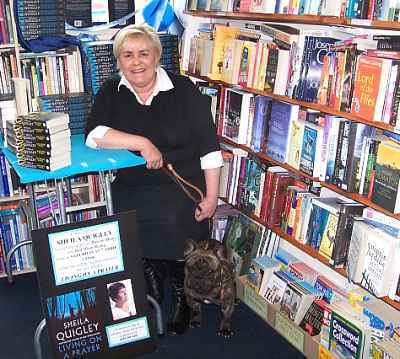 Sheila Quigley is a grannie with attitude and a columnist for the Sunderland Echo, and has a sharp eye for the gritty side of life. Her five novels in the DI Lorraine Hunt series (‘Run for Home’ (2004), ‘Bad Moon Rising’ (2005), ‘Living on a Prayer’ (2006), ‘Every Breath You Take’ (2007) and ‘The Road to Hell’ (2009)are centred on the Seahills Estate in Houghton-le-Spring, where life is not so much lived as clawed from the mean streets. Now, taking a brave step, Sheila has left the estate - and Lorraine – for a while, and begun a new series featuring DI Mike Yorke. The area isn’t so different, but the setting and characters are definitely a whole world away. Sheila, you’ve taken a big step away from the Seahills Estate settings, which your many readers know and love you for. First of all, can you give us a brief description of the setting and the idea for ‘Thorn in My Side’? Much of the events take place on Holy Island. It’s a place that grabs you by the heart and never lets go. Having visited the island many times it was inevitable that one day it would crop up in my fiction. I guess the island came first and Mike Yorke and crew fitted right in. What promoted the change and have you been harbouring the idea for long? This is always a tricky question. Does any author truly know where their ideas come from, or what sets them off? I think it’s like a jigsaw; one day the pieces come together and it’s like someone has fired the starting pistol. As anyone who’s ever been to Holy island will know, this is a great setting; it’s moody, atmospheric and steeped in history. What first attracted you to it as a location – its isolated nature, scenery or history – or all of these? I couldn't have described the island any better. It’s a place that’s screaming out for a good thriller. DI Mike Yorke is a different kind of main character for you. Can you give us a thumbnail sketch of the man and what drives him? Mike Yorke and two other boys were fostered at 8 years old and taken to live on the island by aunt May who fought tooth and nail to get them. The only opposition was her boss in Social Services, who knew he could never replace her. Aunt May won. Mike is a champion of the weak and has been dragging waifs and strays home since he was a small boy. He's also a bit of a ladies man, and loves to smoke ops – that’s other peoples ciggies. Smiler, the young lad who takes a lion’s share of the story, has got a brutal history. How did you set about building this kind of tortured soul? Ah, Smiler. Again, he just walked onto the page fully formed. It amazed me when his history just unfolded. I’ve had lots of emails begging me not to let anything else happen to him. Even my editor phoned me up a week after it had gone to print; she couldn't sleep for thinking of him. She says it’s the first time ever she's had such a reaction to a character. Are you a believer in the power of second sight, which Smiler possesses, or are you strictly down-to-earth? Strictly down to earth, with a wide-open mind. I always tell the kids, a closed mind learns nothing! There’s a strong religious (or quasi-religious) cult/brotherhood element to ‘Thorns’, with the Leader being the main villain, and linked to powerful international families going back generations who exert control over world events. How strongly do you subscribe to this kind of world order conspiracy theory? Again, one never knows. Is what's written about the past strictly true? How do we really know? Some of the papers that have come down could be fairy stories and the truth totally different to what we actually believe. Your many Seahills fans have had to put their favourite reads on hold for a while. How are they responding to this departure so far? I was a bit nervous about this, but they love it. I’ve had countless emails begging me not to forget the Seahills, but please can we have a new Mike Yorke as soon as possible! The style of ‘Thorns’ is very different – much sharper and more urgent. Did you get a buzz from writing this one? Ah, yes. I loved every minute of it. I’d intended for a new Seahills to be next, but couldn't get the ‘Thorn In My Side’ lot out of my mind. And that buzz is as strong as ever. I’m loving every bit of the new one. I went up to the island the other day to refresh a few things in my mind, and forgot to check the tide table. I couldn't get on the island for 4 hours! I was gutted and had to come back home. There’s not a huge amount of ‘language’ in this book (he says smiling). Was that a conscious decision or did you find your characters simply didn’t use it? I guess it’s the same with the new series; not everyone swears, although Aunt May is very fond of the ‘bloody’ word, and Danny lets a few naughty words blast out when he gets frustrated. I know you’re a great horror fan. There a brutal side to this book, including the odd evisceration. Was this a conscious nod to your love of horror? Not really. The horror I like is the more creepy kind rather than having lots of blood everywhere just for the sake of it. You’ve left the ending wide open, with a hint about Mike Yorke returning to London. Does that involve Smiler, too? Can you give your eager readers a little hint, plot-wise? Oh, yes. Smiler is well and truly in the next one. Can’t tell you too much as the whole book isn't in my head yet. That's the way I like it so that I get as many surprises as the reader. Thank you, Sheila, for your time. Here’s wishing you all the best with the series.